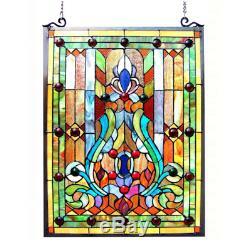 Tiffany-style Victorian Design Window Panel. Transform a bare window into a work of art with this gorgeous Tiffany-style stained glass window panel. Hand-cut pieces of red, blue, green, yellow, and orange pieces of glass are arranged into a Victorian design. This piece is framed in metal and hangs from a 29-inch metal chain. Stained glass in red, blue, green, yellow, and white colors. Metal and art glass construction. 24.75 inches tall x 18.75 inches wide x 0.25 inches deep. The digital images we display have the most accurate color possible. However, due to differences in computer monitors, we cannot be responsible for variations in color between the actual product and your screen. We consider it a top priority that our customers are happy and in the rare event that they are not, we do everything we can to fix the situation. No customer will walk away from our store unhappy. If there's a problem, whether an order arrived damaged, late, or simply because you had a change of heart just let us know right away and we will work with you to make sure your business with us is to your satisfaction! When returning an item, it must be in all of the original packaging and include all of the original accessories or items that came with it. We do our best to process as quickly as possible. 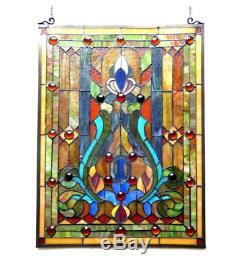 The item "Stained Glass Window Panel Tiffany Style Hanging Wall Home Art Decor 18 x 24" is in sale since Monday, October 02, 2017. This item is in the category "Pottery & Glass\Glass\Art Glass\Stained Glass". The seller is "arvacihomestyle" and is located in Virginia Beach, Virginia. This item can be shipped to United States, Canada, United Kingdom, Denmark, Romania, Slovakia, Bulgaria, Czech republic, Finland, Hungary, Latvia, Lithuania, Malta, Estonia, Australia, Greece, Portugal, Cyprus, Slovenia, Japan, China, Sweden, South Korea, Indonesia, Taiwan, South africa, Thailand, Belgium, France, Hong Kong, Ireland, Netherlands, Poland, Spain, Italy, Germany, Austria, Russian federation, Israel, Mexico, New Zealand, Philippines, Singapore, Switzerland, Norway, Saudi arabia, Ukraine, United arab emirates, Qatar, Kuwait, Bahrain, Croatia, Malaysia, Brazil, Chile, Colombia, Costa rica, Dominican republic, Panama, Trinidad and tobago, Guatemala, El salvador, Honduras, Jamaica, Antigua and barbuda, Aruba, Belize, Dominica, Grenada, Saint kitts and nevis, Saint lucia, Montserrat, Turks and caicos islands, Barbados, Bangladesh, Bermuda, Brunei darussalam, Bolivia, Ecuador, Egypt, French guiana, Guernsey, Gibraltar, Guadeloupe, Iceland, Jersey, Jordan, Cambodia, Cayman islands, Liechtenstein, Sri lanka, Luxembourg, Monaco, Macao, Martinique, Maldives, Nicaragua, Oman, Peru, Pakistan, Paraguay, Reunion.